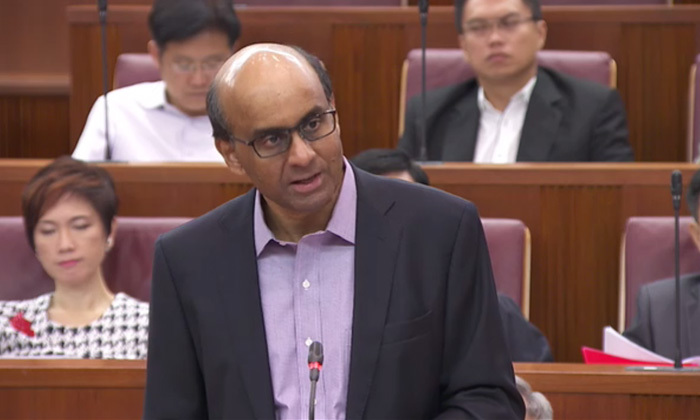 Singapore’s deputy prime minister and minister for finance, Tharman Shanmugaratnam, is set to deliver the annual budget for financial year 2015 in Parliament. It is a historic year to present the budget as the nation celebrates the 50th year of its independence. Follow this page for live updates. The most recent news will appear on top. You can view the live telecast here. “It remains crucial to Singapore to reduce our reliance on manpower and find new and innovative ways to do business,” he says. For example, in the construction sector, the government wants to encourage the companies to more skilled workers, those among the R1 visa group. He adds that the government will strengthen grant support for every form of innovation in SMEs.”We recognise that bringing about innovation involves a range of activities. For most SMES innovation will not come in the form of major technological breakthroughts, but in other forms which are also significant. The productivity level today is 13% higher than in 2009, says Shanmugaratnam. It has grown at an average of 2.5% per year since then, but most of this growth was seen in 2010 and 2011. The Ministry of Education (MoE) and Workforce Development Agency (WDA) will look to enhance existing learning frameworks. After having announced the pioneer generation package last year, and subsidies for lower income citizens, the Finance Minister says that by the end of this year, there will be 24 support officers to coordinate social services for those in difficulty, each with a wide range of social support. This thrust, says the deputy PM, involves a major reinvestment in Singapore’s infrastructure to meet the country’s economic and social needs. The first item on the list is the development of Changi Airport’s new terminal T5. Although this is starting now, the project is expected to take ten years, and together with Tuas Port’s development, is expected to enable Singapore’s position in global logistics. In addition, the government is planning to invest in making Singapore a “highly liveable city.” This includes public transport and expanding every dimension of healthcare (doubling community hospital beds, bringing affordable care into the community). Every effort will be complemented by principles of Smart Nation to improve the quality of life for the average citizen. He says this will mean significantly high development expenditure – it will grow from SG$20 billion in the coming fiscal year to about $30 billion by the end of the decade. “We must make innovation pervasive in our economy, and include as many SMEs as possible,” says the Minister. This, he says, will be possible only if new ideas are brought to the market. To its part, the government will refine the pace of foreign worker levies. The tight labour market, he says, is a reality, and firms have to devise new ways to survive and grow accordingly. Bosses must look for potential in their people and put in time and effort in recognising this. This includes finding the potential in mid-level professionals. Being small we can’t achieve expertise in every area, says the finance minister. He stresses that the nation has to build its strengths in areas already developed. This leads to five growth clusters for the future – advanced technology, applied health sciences, small and sustainable urban solutions, logistics and aerospace , and Asian and global financial services. 1. Invest in skills of the future and empower every individual to learn and develop through life, not just learn early on in life. 2. Continue to restructure the economy and support the next generation by promoting innovation and internationalisation. 3. Invest in economic and social infrastructure for the future, to create competitive strengths and quality healthcare. 4. Strengthen assurance in retirement, by complementing the pioneer generation package announced in recent years and enhance support for middle-income families. Shanmugaratnam opens his speech by saying that the country anticipates a “very small” deficit of SG$0.1 billion in the past year. He adds that the global outlook for 2015 is uncertain – the US continues to recover, while the Euro zone features new uncertainties. Singapore can expect overall inflation to be close to 0% in 2015, while 2014 saw the unemployment rate for citizens lower than 2%. He also noted that there were more women working, and more older workers staying on in employment. Here are the reasons why staff's request to apply for sick leave because of a painful back will not be entertained. .. The latest World Management Survey ranks Singapore in fourth place worldwide for people management practices, just behind the US, ..